Kristina Huxley is an artist, living and working in Dublin, Ireland. 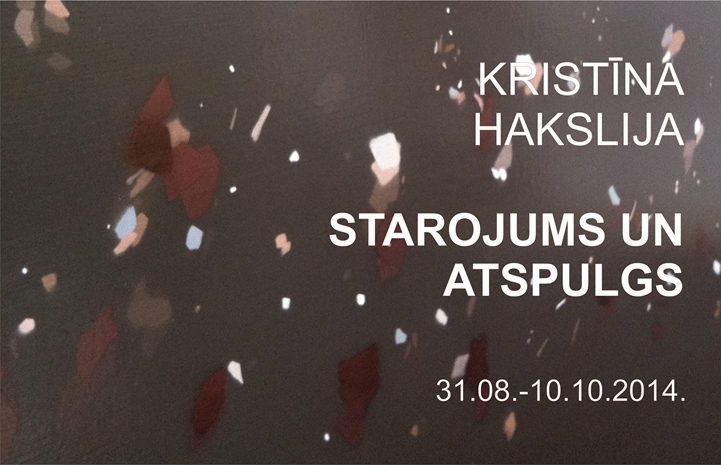 “Radiance and Afterglow” is the title, given to the series of works by Kristina Huxley that have been produced in response to the exhibition space and Mark Rothko Art Centre, for Daugavpils. The ‘Sensitive Paintings’, occurring since 2000, have been produced specifically for the context of the Mark Rothko Art Centre together with paintings from a new series, ‘In-Transit, Radiance and Afterglow’ to deliver a visually transient space and place to pause. As a painter, Huxley’s practice investigates change, an invisible process, through an exploration of its visual and physical potential. She pursues the ephemeral details of human existence, often those that we can sense and not see with particular attention to those that underline the precariousness of our ontological being. Her subjects in this exhibition are overlooked substances; heat, debris and dust are intrinsically of low value and are difficult to measure and contain; they exist on the periphery of our being. Simultaneously they are something and nothing. During the 90’s, Huxley’s work, such as ‘mushroom series’, ‘orange series’ and ‘condensation series’, used ephemeral and organic materials turning invisible processes into visible matter; functioning as indexes and catalogues of process and change. Condensation, heat, moisture and other unstable materials were utilized to present continuously evolving processes and constant transience creating dialogue with time, about time and the present. These temporal works functioned as observatory, framing and enhancing our perception of the phenomenon of change and the mysteriousness of the world around us. For Huxley, painting enables a terrain and visual field where visibility and invisibility are inseparable. She has consistently been concerned with temporal issues within painting. Paintings, for Huxley, are always changing and have the ability to change their surroundings. Why do we consider them still, static beings, from the past as though they are images left behind from another time? Huxley considers painting in opposition to this presumption. Negating the limitations of the still image in painting, Huxley first developed the ‘sensitive paintings’, in 2000, a series of paintings on canvas using industrial heat sensitive pigments creating surfaces in constant motion, that are permanent and permanently changing. Slowly changing over a period of time, the paintings deliver multiple images for which the outcome is affected by the environment in which they are located. They present a permanent process of transition; a constant cycling of imagery changing from a preceding state into a succeeding one. Beneath the canvases heating systems are hidden, controlled by timers, triggering the deeply dark coloured surfaces to vanish where the heat occurs. When the timers switch off the surfaces return to their original colour and temperature before the cycle starts over again. Within her current work, the ‘in-transit’ series use colour shifting pigments from automotive industries, compositional strategies and destabilising contradictions to underline a permanent sense of restlessness, perpetual change and constant state of transience. Presented here, ‘In-Transit, Radiance and Afterglow’, pursues further the durational aspect within painting. Interrogating the absurd visual pleasure in the explosive, consistently found in film and music, the paintings usurp the moment of transition between fragment and particle states. The large gloss paintings, containing an excess of marks set within the coordinates of exploding debris, articulate separation and suspension revealing our attachment to all that is about to fall. The paintings are made using traditional processes and methods, layering layer upon layer of translucent ambivalent colour, merged with outer layers of colour changing pigments. The marks within the surface overlap and collide; echoing and repeating the previous layers. The gloss surfaces reflect and hold the viewer within; the viewer vital to further changing the surface of the painting, revealing the surface ever more elusive and unexpected. Unfolding a conversation between our temporal and permanent being, semblance and perception they amplify our physical relationship to the world.